Year 2015 like any other years has various celestial events lined up for every one of us to be enthralled. 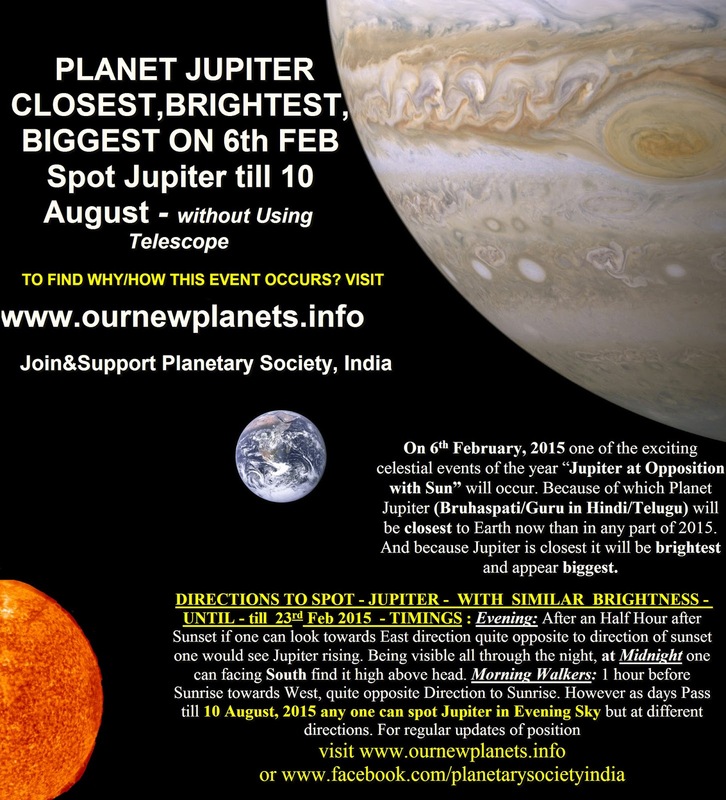 On 6th February, 2015 one of the exciting celestial events of the year “Jupiter at Opposition with Sun” will occur. Because of which Planet Jupiter (Bruhaspati/Guru in Hindi/Telugu) will be closest to Earth now than in any part of 2015. And because Jupiter is closest it will be brightest and appear biggest. It’s known fact all Planets (including Earth, Jupiter etc) orbit Sun. During the course of Journey around Sun the positions of Earth & Jupiter is that they will have face off which is known as Opposition. In other words Due to this phenomenon of opposition Sun- Earth- Jupiter would be opposite to each other from our perspective on earth. And in a line if one can see them from above with Sun &Jupiter on either side of earth. Because of this an observer can easily locate Jupiter looking opposite direction to Sun Set in the evening. Similarly in the morning has to look opposite direction of Sunrise to locate Jupiter. In other words Due to phenomena of Opposition as the Sun sets in west, Jupiter rises (east) in the evening. Whereas as Sun rises in the Morning, Jupiter sets in west. On 6th February, 2015 – Closest: Generally the minimum distance of Jupiter from earth is 588 Million kilometers approx. Whereas the Maximum distance is 967 Million km approx. On the 6th February, 2015 Jupiter will reach closest point at 4.346 A.U. or 650 million km which is very close to its minimum distance from earth. Further this is the closest Jupiter can get to earth till year 2020.